It’s official. Sarah Preston has actually given up on finding love. The only problem is that she probably shouldn’t have made that declaration so loudly, in the middle of Bayside Brides boutique, which was once—and still is—her dream job. When her boss challenges her to give her heart one last try, she agrees, reluctantly, to give the next single man she comes in contact with a fair chance, but little did she know he would be downright impossible. 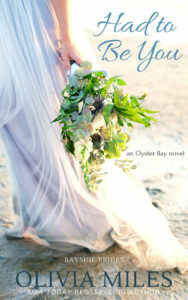 Wedding planner Chloe Larson is perfectly content helping other women find their happy endings. Love is the last thing on her mind, especially when she has a business to grow. But when a charming suitor sweeps her off her feet—literally—at a friend’s wedding, she begins to see firsthand what all the hype is about. 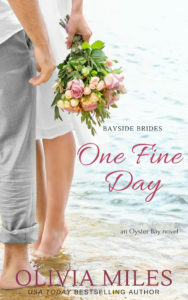 When the opportunity to plan a high-profile wedding is presented, Chloe is thrilled to take on the task, especially when a competitive business moves into Oyster Bay…that is until she learns that the groom is Nick Tyler—the very man she has been hoping to run into again. As plans get underway, the groom isn’t the only one having doubts. Chloe has always been risk adverse, but now, she may have to take the greatest chance of all…to save her business and her heart.